Sarah gets spat at in the street. Frankie doesn’t go to her lectures. In the aftermath of the tragic accident that brought them together, neither expects to find solace in the other's company. Between hate mail and novelty teddy bears, the two women become something like friends. They want to punish themselves. They might just save each other. A tender and unflinching story about motherhood, self destruction and the way women help each other heal. Soft Animals is the debut play from Tony Craze Award shortlisted writer Holly Robinson, and is directed by Soho Resident Director Lakesha Arie-Angelo, director of the critically acclaimed The Hoes, Hampstead Theatre and assistant director on Vicky Jones’ The One and Touch at Soho Theatre. 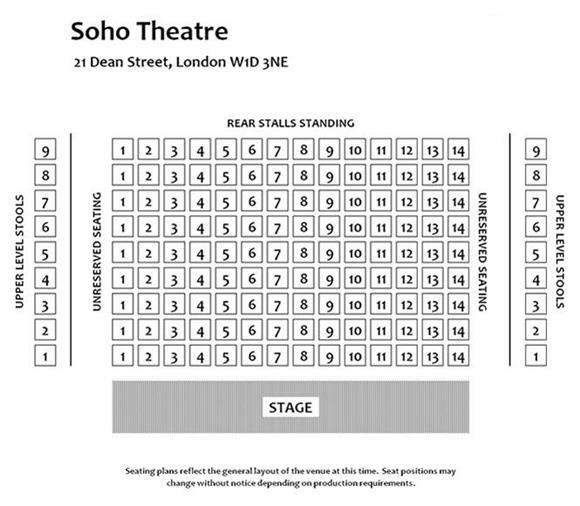 Soho Theatre owns its own Central London venue housing the intimate 150-seat Soho Theatre, our 90-seat Soho Upstairs and our cabaret space, Soho Downstairs. Under the joint leadership of Soho’s Artistic Director Steve Marmion and Executive Director Mark Godfrey, Soho Theatre now welcomes 167,000 people a year. For me the combination of cutting edge new writing, the best in comedy, the reputation for brave collaboration and a young dynamic audience, makes Soho one of the most exciting venues in British theatre.